"My favorite Lenten activity. Great kickoff to Easter celebration." "This reflection in movement on the Stations of the Cross heightens my prayerful entry into Holy Week. The rich Catholic tradition of the Stations of the Cross is enriched by the compassionate reflections and the loving movements in solidarity with Christ." "I loved this. The instructor was gentle and lovely and the poses associated with Jesus' Stations will be with me now in every yoga class. Thank you." "Thank you for bringing this to us again this year. It is truly a gift for our parish! We look forward to next year!!!" "Loved it. The music was gorgeous and spiritually enhancing." "This was one of the most beautiful spiritual experiences I have ever had." Welcome and all blessings, Anne. For any who may have questions about whether this meditation contains any elements of any Hindu or "new age" religion by virtue of the use of the body in prayer, it does not. As the previous Pope Benedict, when serving as a Cardinal under Saint John Paul II, wrote in his tract on the perils of new age religions and practices, Christian prayer must be centered upon Christ, even though prayer can take different forms: "All meditation techniques need to be purged of presumption and pretentiousness. Christian prayer is not an exercise in self-contemplation, stillness and self-emptying, but a dialogue of love, one which''implies an attitude of conversion, a flight from "self" to the "You" of God'". 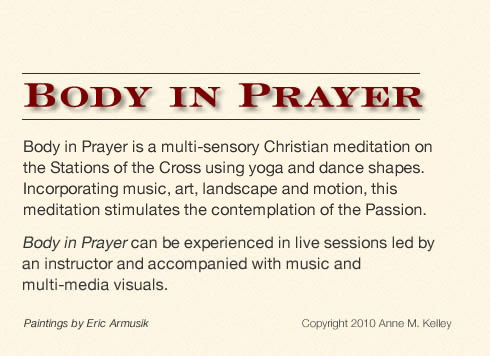 The Body in Prayer meditation is totally focused on Christ and His passion, with all physical movements reinforced and punctuated by artwork depicting the traditional Stations of the Cross, spoken meditations, and Lenten music from the classical, spiritual, chant and contemporary genres. The word "yoga" in relation to this Roman Catholic meditation is purely descriptive of physical poses as they are commonly referred to in the vernacular; it is not a reference to Hindu religion or prayer, and no new age, Hindu, Zen or other transcendental elements, prayers or features are presented or intended during the meditation. Rather, by engaging multiple senses, the meditation facilitates participants' focus on and appreciation of the Stations of the Cross and Christ's Passion and Resurrection, the bedrock of our faith. Please visit our new sections for video, news and information.